Hemming the knit garments that we sew can often be a frustrating experience. Wavy, stretched-out, lumpy, and uneven hems are all too common. 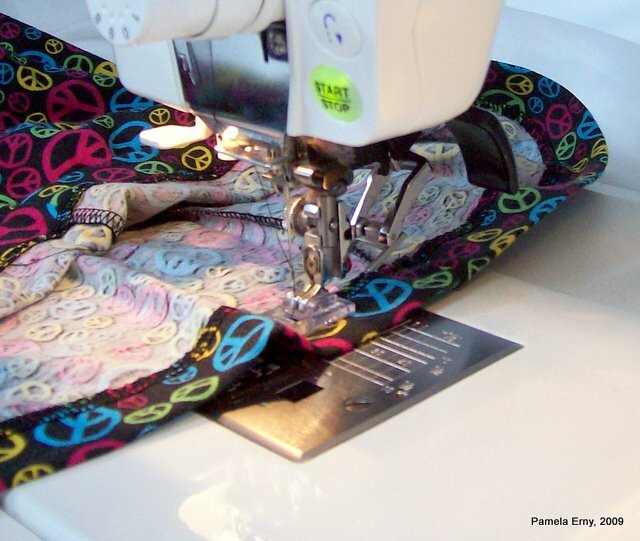 Here are 2 easy ways to get great looking hems on knit garments every time! The first way to hem knit garments and the one I use most often is by "Crowding the Needle". Clear "Water Soluble" embroidery stabilizers...such as the brand-name product, "Solvy"
(easily available at chain fabric stores). As pictured below, first cut about a 10-inch length of the stabilizer. Then roll it up into a tube. Next, as shown below, cut off a "slice" of the tube the depth of the hem. I usually cut several 1-inch "slices", as that is the hem depth I use on most knit garments. Now you have several nice uniform strips of stabilizer ready to FUSE your hem. Just as you would use regular fusible web to permanently fuse a hem, place your strip of "clear wash-away stabilizer" between the hem allowance and the garment ("inside" the hem). Then thoroughly steam-press the hem. This melts the water-soluble stabilizer strip, temporarily holding the hem in place while also making the hem area firm and completely stable. If the "Clear wash-away stabilizer" doesn't melt enough to hold the hem in place, steam again from the other side, or lightly spray the hem area with water and steam again. Now stitch your totally stabilized hem. A twin-needle hem works especially well, because the hem area is so stable that the stitches will not "tunnel". Once your hem is stitched, the stabilizer is easily and completely removed from the garment by a quick trip through the rinse cycle of the washing machine. After drying, your hem will be soft, flexible, and beautiful...with no puckers or waves!